Say what? Hoecake? What in the world is a hoecake? 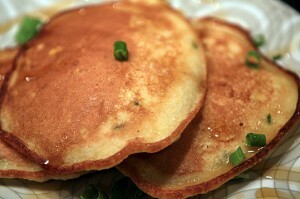 Hoecakes are a delicious old southern “dish” that farmers would make to keep there energy high while working in the fields. This traditional recipe is made from corn meal, water and salt. Think of it as a marriage between a pancake and cornbread. Farmers would originally cook these cakes on the flat of a hoe over an open fire, hence the name. Preheat the oven to 200 degrees. In one bowl combine flour, cornmeal, sugar, baking powder, thyme and a good pinch of salt. In another bowl add corn, egg, milk, and vegetable oil. Whisk together until combined and then pour into the bowl with the dry ingredients. Combine and allow to rest for at least 5 minutes. In a large skillet on medium-high heat, add a couple tablespoons of butter. Make sure you add enough to coat the bottom of the skillet. Using an ice cream scooper, add the batter (in batches of two or three) to the pan. Gently flip the cakes when the air pockets begin to pop on the surface of the batter – like pancakes. Once the second side is golden brown, transfer the cakes to a baking sheet in the warm oven while continuing to make the remaining batter. Serve with a light drizzle of high quality maple syrup. Yum!